Scott Allie and Kevin McGovern @ CE 10/21! On Wednesday, October 21st, from 5-7 PM, Comix Experience is pleased as punch to bring you an in-store appearance with EXURBIA co-creators Scott Allie and Kevin McGovern! Most of you probably know Scott Allie as the Editor Extraordinaire on such (awesome) books as BUFFY THE VAMPIRE SLAYER, CONAN, and HELLBOY, but he's also an accomplished writer (THE DEVIL'S FOOTPRINTS, SOLOMON KANE: THE CASTLE OF THE DEVIL, and THE FOG, among others) EXURBIA is his newest book and it’s received great response from folks like Gilbert Hernandez, who wrote, “Exurbia boldly continues and transmogrifies the type of lunatic stories that only comics can do with any justice. Try as films and TV might, here is the real stuff. Bravo and yikes at the same time.” Now THERE'S a pull quote! 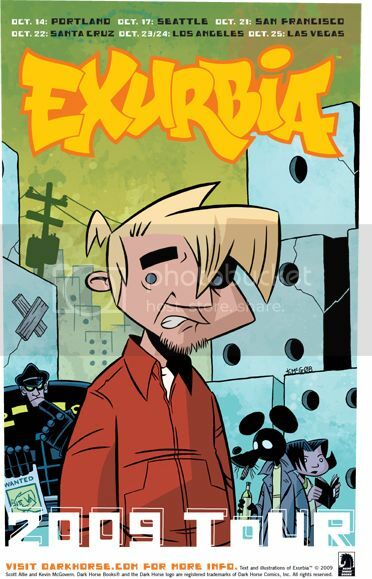 EXURBIA is artist Kevin McGovern's debut comic, and he's got a very appealing bigfoot cartooning style. While I'm generally loath to send people off to other retailer's websites, you can read a 13 page preview of EXURBIA over here. Scott is a genuinely nice guy who has an infectious love of comics, so I really want to urge you to come on down and meet him and help support his writing. Wednesday, October 21st, 5-7 PM, Comix Experience -- 305 Divisadero St., at Page, in San Francisco -- be there! !